In a nail biter game against the Chiefs last weekend the Patriots made history making it to a third consecutive year in the Super Bowl. The Super Bowl may not be at our home stadium, but that won’t stop Boston’s streets from a flood of Patriot-ism for this year’s Super Bowl Llll! The South End of Boston will be bustling with viewing parties - some hot spots including, Clery’s - known for their annual wing eating contest. Also, McGreevy’s, just a short walk, a popular venue with 20+ HDTV’s, so you won’t miss a second of the action! Just across the street you can watch from Earls in the Prudential Center. Earls will be hosting a viewing party February 3rd, and just like our New England Patriots, their menu cannot be beat. It is definitely a solid option for Super Bowl Llll. That’s just to name a few places! The Back Bay Social Club will be hosting ‘The ULTIMATE Super Bowl Viewing Party!’. If you like your wings coming in hot, a friendly gamble on a Super Bowl square challenge, not to mention pitchers of beers and a giant projector screen, then RSVP with the number of people you want to celebrate Super Bowl with at Back Bay Social Club! The event will be welcome to all 21+. This event will surely be a fantastic way to cheer the team on to victory! While night life in combination with the Super Bowl is one way to cheer on the team - the experience is just as exciting when watching with friends and family from the comfort of your very own couch. To make it easy for you, check out this list of top of the notch caterers sure to make Super Bowl Llll special for you and your family/friends! Blue Ribbon BBQ offers game day packages to order for pick up. The packages feed six to eight people and include options that will surely satisfy your guests, including the game day necessity foods: chili, wings, pulled pork, hot links, burnt ends, and tons more to choose from! There are many catering and pick-up options throughout the city. Another Boston spot, The Smoke Shop BBQ, is also offering game day packages with wings, ribs, pulled pork sliders, and mac and cheese - yum! 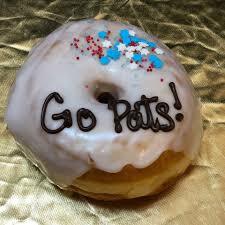 Dough-not forget to order one of South End’s treasures - a six pack of football inspired doughnuts from Blackbird Doughnuts on Tremont Street! These will surely be the hit of the party for all ages - anyone will enjoy these festive treats! You can also try the buffalo pizza with chips, dip, and more. Brady wouldn’t be the only GOAT you experience on game-day. Whether you are spending the Super Bowl out on the town, or having a viewing party at home, make your viewing of Super Bowl Llll a touchdown for you and your loved ones by enjoying some of these phenomenal game time foods the South End restaurants/bars have to offer. Remember, most of the aforementioned delivery options, so you won’t even have to leave the comfort of your living room until the doorbell rings. With another Boston/New England championship win potentially on the horizon, Go Pats!! Boston’s South End is the perfect spot for a romantic getaway.